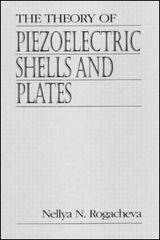 This is the first book devoted to a systematic description of the linear theory of piezoelectric shells and plates. In the first part of the book, the theories for electroelastic thin-walled elements of arbitrary form with different directions of preliminary polarization are presented in an easy form for practical use. The approximate methods for integrating the equations of piezoelectric shells and plates are developed and applied for solving some engineering problems. In the second part, the theory of piezoelectric shells and plates is substantiated by the asymptotic method. The area of applicability for different kinds of electroelastic shell theories is studied. A new problem concerning the electroelastic phenomena at the edge of a thin-walled element is raised and solved.